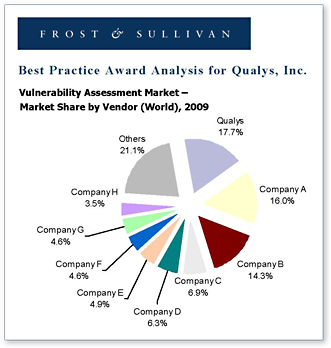 Qualys today announced that Frost & Sullivan has awarded Qualys its 2010 Global Market Share Leadership Award in Vulnerability Assessment. Based on its recent analysis of the market, which included in-depth interviews of customers, partners and vendors along with market analysis, the award recognizes excellence in capturing the highest market share within its industry and highlights Qualys&apos; innovative strategies that have enabled growth. The award report states, "Frost & Sullivan’s research shows that Qualys has been able to grow at a rate that far surpasses that of its competitors as a direct result of leadership in multiple areas. Not only is this continued excellence critical for Qualys&apos; success as a company, but Qualys&apos; leadership is driving the vulnerability assessment market’s growth as well." To read the report, visit http://www.qualys.com/docs/QualysLeadershipAward.pdf. To read more about what industry analysts have said about Qualys, visit http://www.qualys.com/company/newsroom/analysts/.